Just recently Juice Beauty has gotten into the field of cosmetics. I have always ADORED their skincare and when I received these fun highlighting sticks I thought for sure I was going to love their makeup. And you know what? I was right. Phyto-Pigments Flash Luminizer is a multi-tasking illuminator and cheek color duo that is available in three shade options: Golden/Bronze, Cream/Marigold and Blush/Rose. They are designed to instantly add gorgeous color and luminous sheen to every complexion. 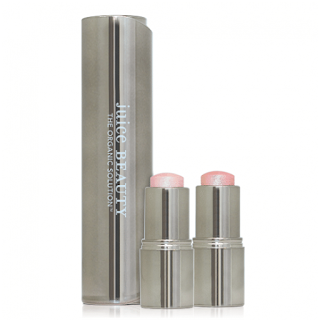 The weightless, buildable texture glides onto skin, reflecting light to create a variety of effects. The dual-ended stick allows for precise application and on the go touch ups. Two highlighter duos diffuse light for a soft focus and radiant effect and a bronzing duo adds contour & definition for a sculpted look. These are for all skin types and for all ages who are looking for a complexion booster, with beautiful radiance. The highlighter duos are perfect for strobing. The bronzer duo is ideal for a healthy flush of color year round. These instantly absorb and blend easily. Hydrates skin with organic coconut oil. Has anti-oxidant protection with Vitamins C & E. Formulated without parabens, petroleum, propylene or butylene glycol, sodium lauryl sulfates, phthalates, artificial dyes or synthetics fragrances. These products have never been tested on animals. I like the way these wear. They illuminate the face with a nice glow and have great ingredients that provide nice skincare. I think Juice Beauty has done well for their first foray into the cosmetics realm. They have a huge line of cosmetics, all of which I think are very good. I love their skincare, now I will love their cosmetics. Juice Beauty Phyto-Pigments Flash Luminizer retails for $32.00 and is available online at www.juicebeauty.com, and anywhere that Juice Beauty is sold. Like Juice Beauty on Facebook:https://www.facebook.com/JuiceBeauty; Follow Juice Beauty on Twitter:@juicebeauty; Follow Juice Beauty on Pinterest:https://www.pinterest.com/juicebeauty/; Follow Juice Beauty on Instagram:https://www.instagram.com/juicebeauty/ and Subscribe to Juice Beauty on Youtube:https://www.youtube.com/juicebeauty.